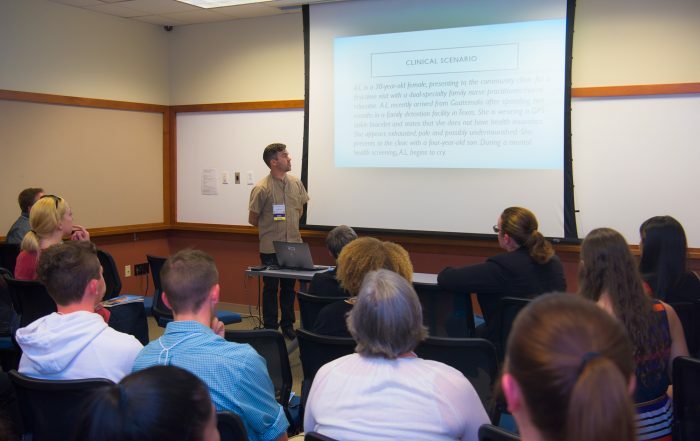 A graduate student presents at the 2018 Graduate Student Research and Creative Activity Conference. This year marks Southern Connecticut State University’s 125th anniversary, and the university is hosting four exciting on-campus events in April and May in celebration of its commitment to research and innovation: three research and creative activity (RAC) conferences and a career forum. The fifth annual Undergraduate Research and Creative Activity Conference kicks off Saturday, April 13, from 9:30 a.m. to 4 p.m. in the Michael J. Adanti Student Center Ballroom. The conference honors scholarship and creativity in all forms. Through the observation, interpretation, and documentation of various scholastic disciplines, this RAC conference intends to celebrate our journey to enlightenment. You’ll discover a showcase of undergraduate student research, oral presentations, theatrical performances, art installations, music, and more — all demonstrating the diverse scope of subjects engaged by undergraduate students as well as illustrating the important parallels between them. Register for the Undergraduate Research and Creative Activity Conference here. Are you interested in a career in one of the fasting growing high-impact areas? Don’t miss Jackson Labs/BioPath Career Day on Friday, April 26, from 9:30 a.m. – 2:30 p.m. in Engleman Hall A120 and the Academic Science and Laboratory Building. This year’s theme is personalized medicine/digital health and team science, and the conference features a line-up of notable professionals, innovative companies, and distinguished speakers. Last year’s event drew more than 250 students from Southern and surrounding universities and professionals in the bioscience fields. At this event, students will gain a solid understanding of what type of training is needed for a bioscience career, learn what skills employers are looking for, and how to land a job. There also will be panel discussions and networking sessions for professional advancement. This event is hosted by The Jackson Laboratory, Southern Connecticut State University, BioPath: Bioscience Academic and Career Pathway Initiative, and the Connecticut State Colleges & Universities System (CSCU). In partnership with BioCT, dedicated to growing a vibrant bioscience ecosystem in Connecticut. Register for Jackson Labs/BioPath Career Day here. The CSCU Faculty Research and Creative Activity Conference will take place Saturday, May 4, from 9 a.m. to 2 p.m. Entitled “Making An Impact: Pursuing New Knowledge Through Boundary-pushing Research and Creative Activity,” this RAC conference will feature artist talks; films screened in a dedicated theater; a gallery of posters and the opportunity to interact with the researchers; studio demonstrations; oral presentations; and tapas, during which speakers will give four-minute rapid-fire presentations. Register for the CSCU Faculty Research and Creative Activity Conference here. The conference, which is a new tradition in recognition and support for graduate students, aims to not only encourage continued work as a community, but also to awaken individual curiosity and purpose. In 2018, graduate students showcased more than 130 presentations. Register for the Graduate Student Research and Creative Activity Conference here.